A sweet glaze will permeate the meat with flavour and keep it succulent. Waitrose gammons don't need to be pre-soaked. 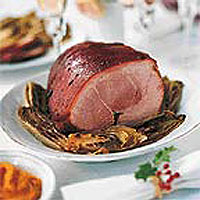 Place the gammon in a large pan, cover with cold water and add the thyme, bay leaves, onion and garlic. Bring gently to the boil (this will take about 30 minutes), skim the surface and simmer for up to 1½ hours. To check the meat is cooked, remove from the water and insert a skewer into the middle - the juices should run clear. Strain off the stock and reserve it for the carrot and cardamom purée. For the glaze, grind all the spices in a pestle and mortar, then blend with the honey. About 1 hour 15 minutes before serving, preheat a roasting tin in the oven for 15 minutes at 190ºC, gas mark 5. Add the olive oil and place the gammon in the roasting tin. Warm the glaze in a pan and pour over the gammon. Place in the oven and bake for 40 minutes, basting every 10 minutes until golden brown. To prepare ahead, at the end of step 2 leave the cooked gammon to cool, cover, and place in the fridge for up to 48 hours. Remove 1 hour before glazing.